Back to back days with three passes, whew! Today was a pretty fun day with tons of photos, so enjoy this post. So far, this has been my favorite route of the summer. We know the latter half of this route seems more daunting than the first, but so far, I’d say Skurka has done a great job of piecing together a fun route with a great balance of things. 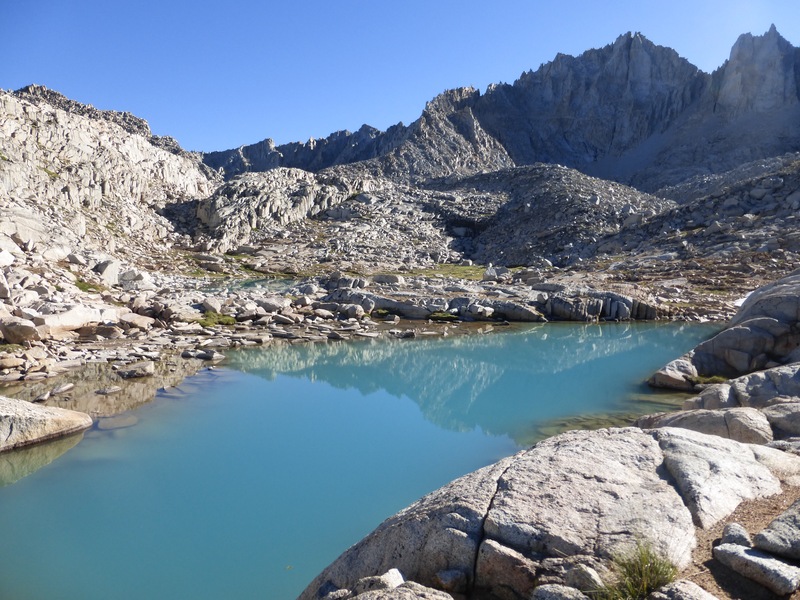 I also want to add that the quality of the guidebook is much more complete and polished than the Wind River High Route Guide. There is a third version yet to be released with all the current updates, but we are using an interim document Skurka has created that covers most the updates to the route. It does mean checking four different resources (guidebook, map, interim update, data sheet), which is a bit frustrating and more time consuming, but at least it’s all there. So far, we haven’t needed to turn on the GPS once, so that’s been great too. It was cold again this morning and I had my down jacket on for a good portion of the morning. 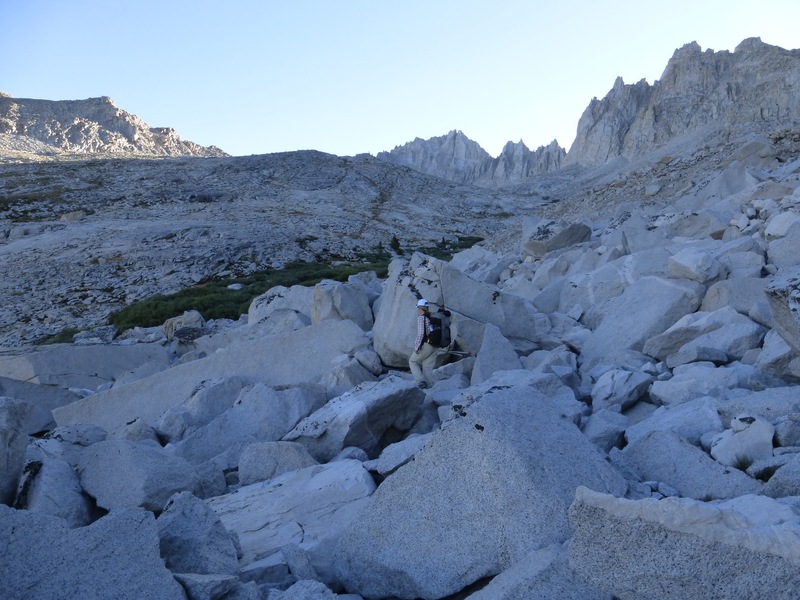 Our first task was Talus Pass. We hiked up the canyon along Talus Creek and got to a great morning view looking down on Talus Lake and Pass. 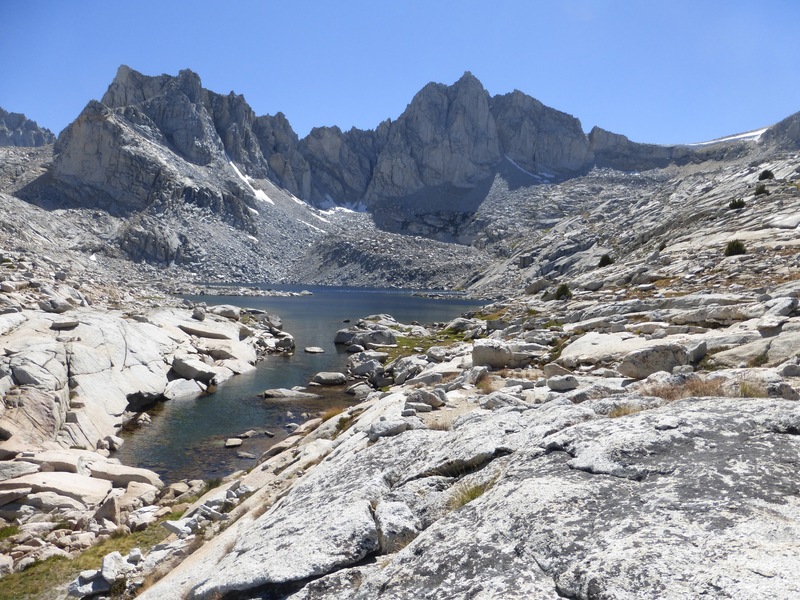 Talus Lake (left), Talus Pass (right). Dropping down to hit Talus Pass. 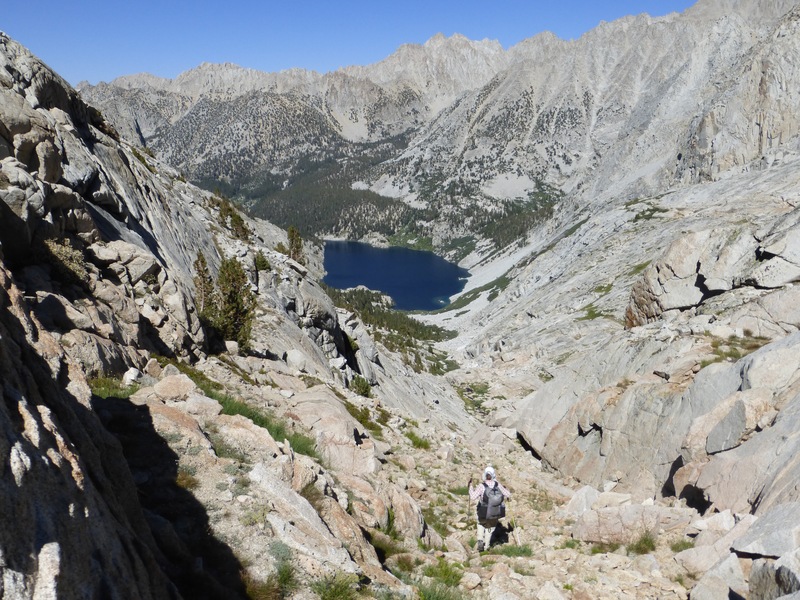 Then we contoured around an followed Table Creek up to Gem Lakes. Again, surprisingly great terrain with some rocky stuff to get over and then granite slabs again, yay! We are still in shock of how much of this nice terrain we’ve gotten. Heading up to Gem Lakes. Looking back on Talus Pass (left dip). Next up was Thunder Ridge Pass. We were talking on the way up and both spaced on taking a photo of the pass before we got over. 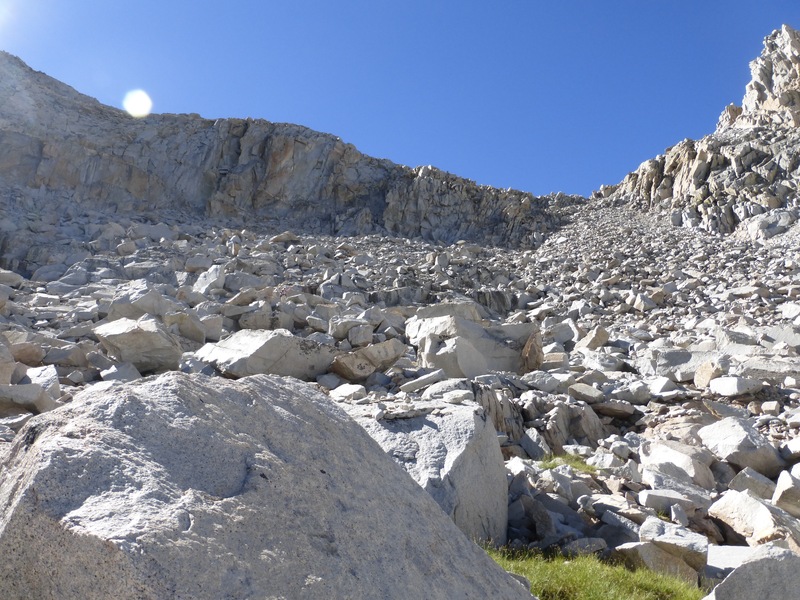 This was this first pass we’ve done with a decent amount of talus on the descent. There wasn’t much on the ascent. 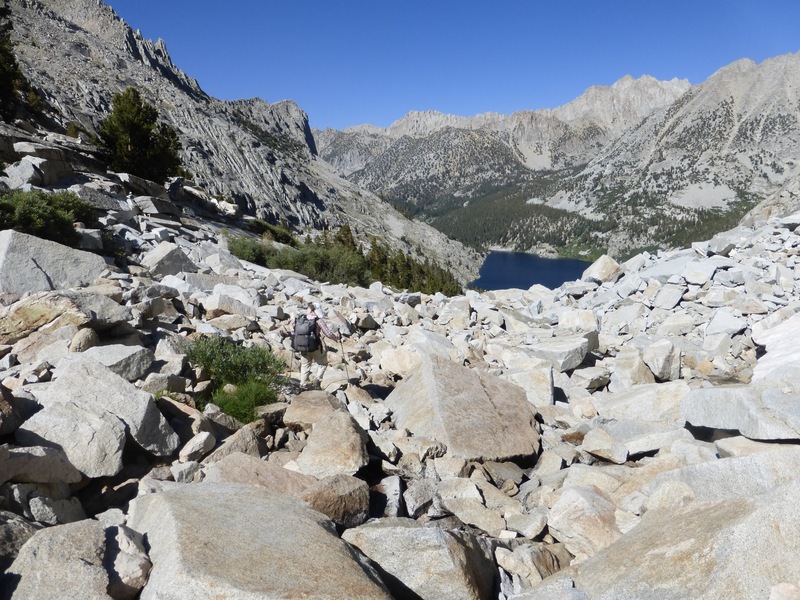 Descent of Talus Pass. Find E…above the front center left boulder. We had fun on that descent. The boulders were solid and we could keep a fairly fluid flow boulder hopping. Right in the center, we both ran into some huge car sized ones that we had to find a way around or even under. Once down to more solid footing, we needed to contour just above three lakes so that we could make a turn into a new canyon. We contoured on the right above these lakes. 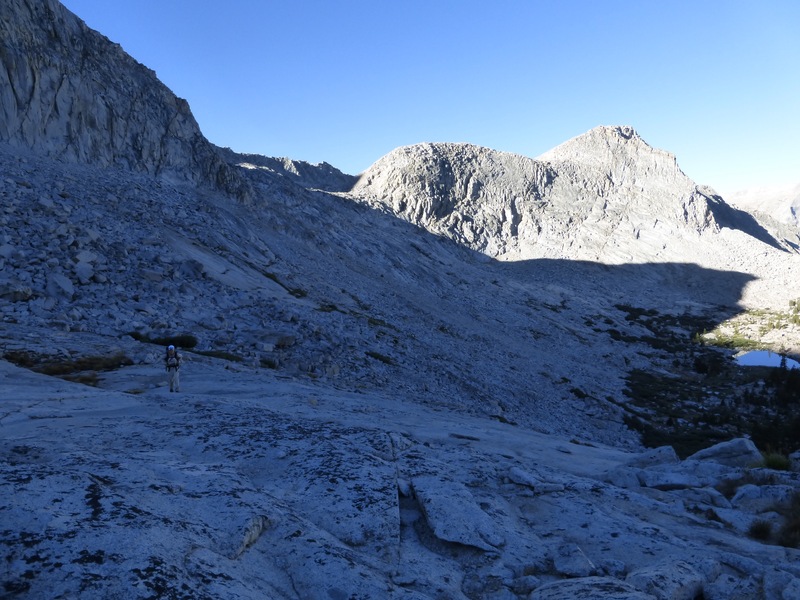 That canyon led up to Cunningham Creek and we could see our route to our next pass, Longley Pass. We had fun looking at it as the top of a cartoon cat head. Our goal was to head over the right side of the left ear. 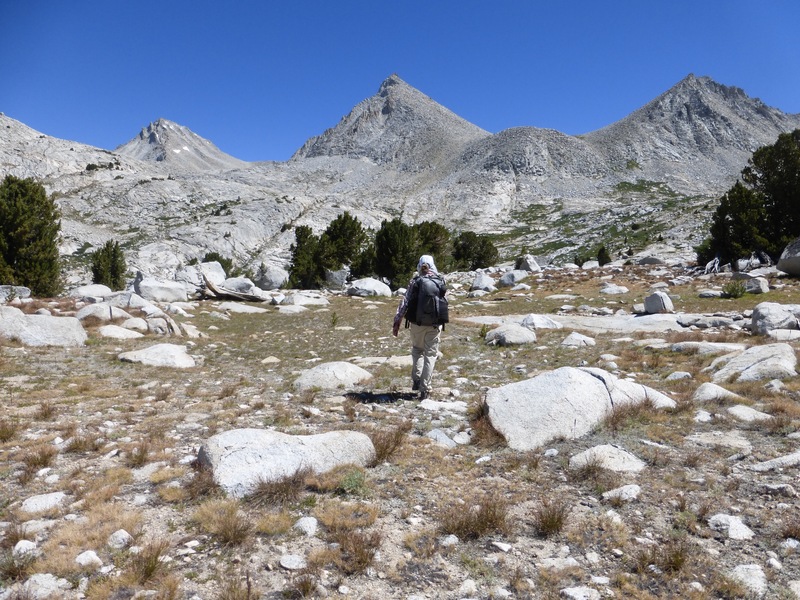 Heading towards Longley Pass (not yet visible). We found a great ramp that took us up easily without having to deal with Cunningham creek and willows. 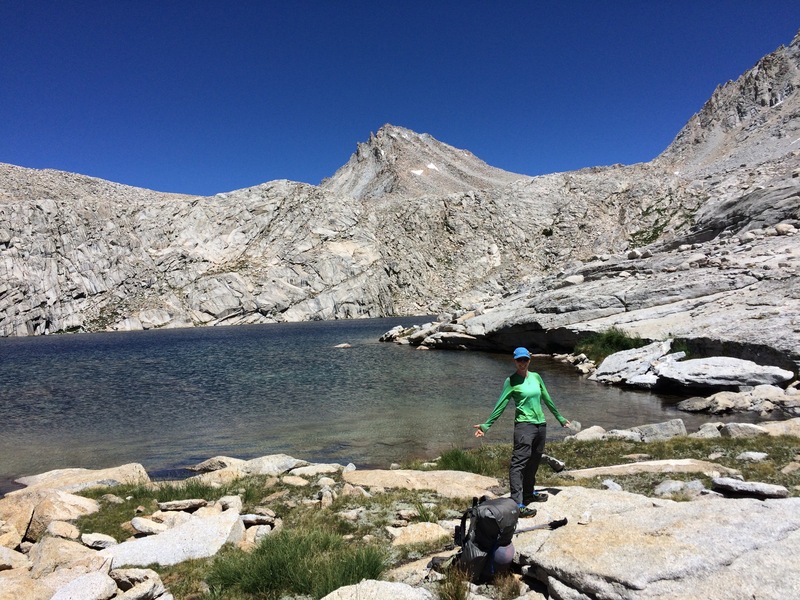 We were having such smooth going with it that we accidentally went up a bit too far and hit the source of the creek, South Guard Lake. It ended up being the perfect lunch spot, ha! Lunch at South Guard Lake. The climb up Longley Pass was non technical, steep, and sandy/gravely. We had a nice surprise waiting for us at the top. 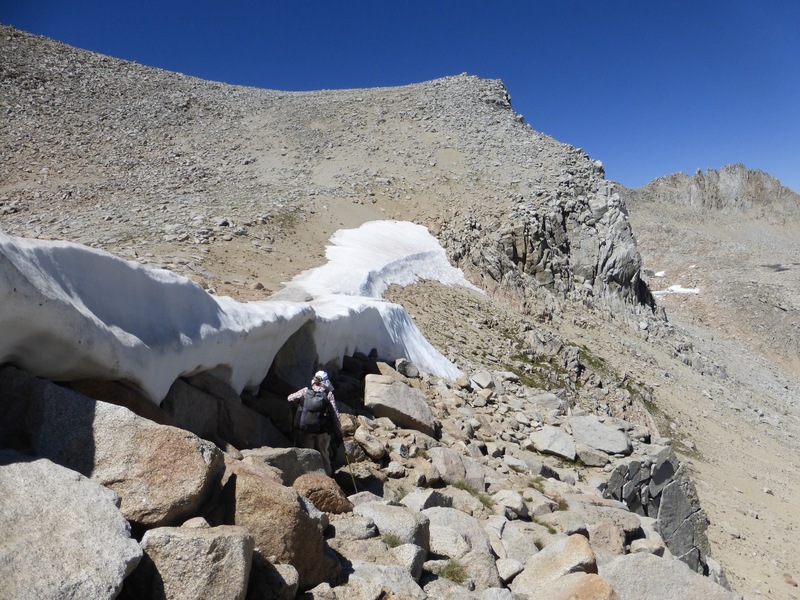 A cornice covered the whole length of the pass, and it appeared that we might not have a way over. Thankfully, when we investigated further, we were able to go around the cornice on the right side and then walk the full length of the cornice below it to get to where we could go down. Traversing under the cornice on Longley Pass. Me enjoying the sandy plunge down Longley. From there, we had 3,000ft to drop over 5mi to where we planned to camp. It was a fun heel plunge almost like a sand dune down the first part of Longley. Then there was some nice walking along a tarn and unnamed lake. The view looking back was great. 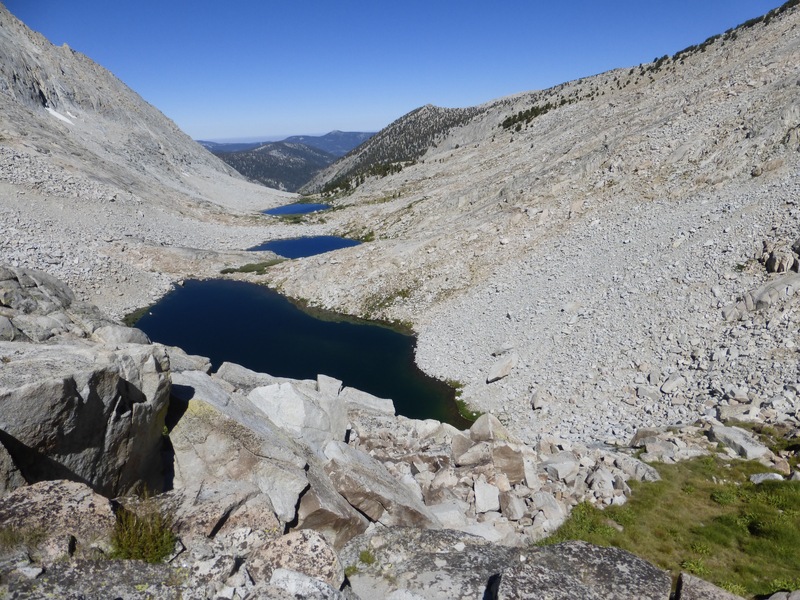 I feel like earlier in the summer, on the Sierra High Route, the views weren’t as clear and crisp as they’ve been the last two days. It’s been nice and makes us wonder how the fires are doing in the area. Looking back. Longley Pass is on the upper right. 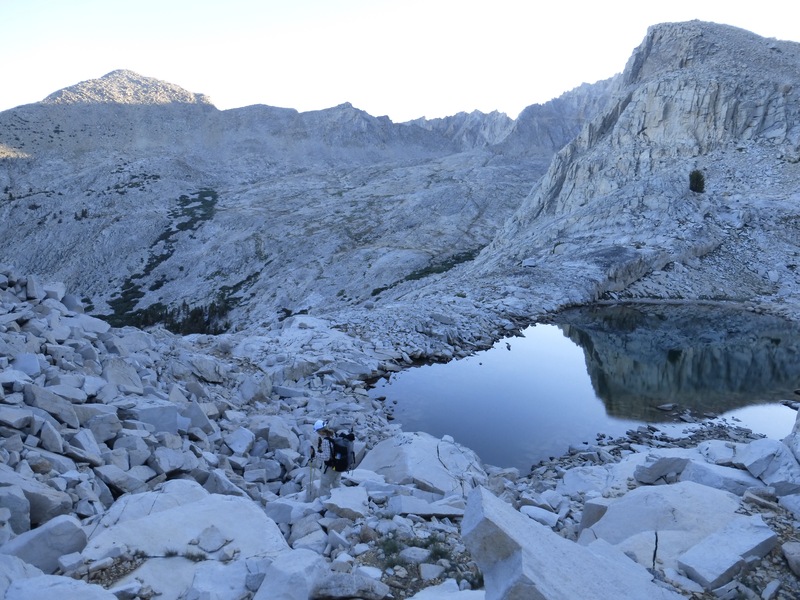 Maybe I was tired towards the end of the day, but the descent to Lake Reflection felt like the most tedious part of the day to me. It was 2hrs of slowly making our way down to, and then along the lake. It is a large lake. We had large talus, willows, woods, and granite slabs. E had fun leading on this one and I was happy to turn off and follow for awhile. Large talus along the creek. The notes say to follow the creek down, and that probably works just fine, but we got lured left of the lake following game trail and had fun trying to dodge willows and use granite slabs. It worked out pretty well and it turned out that we needed to be high anyway at the end of the lake to get over a cliff band. 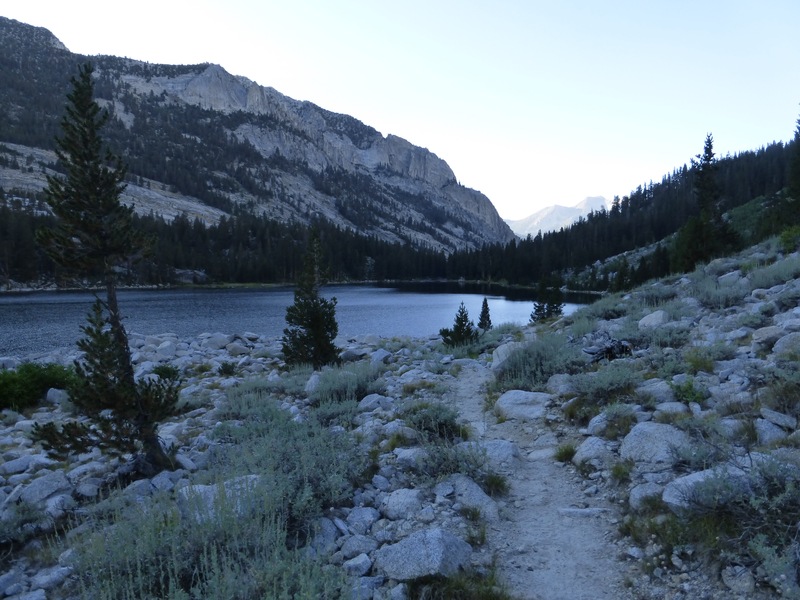 When we got to the end of Reflection Lake, there were some nice campsites. 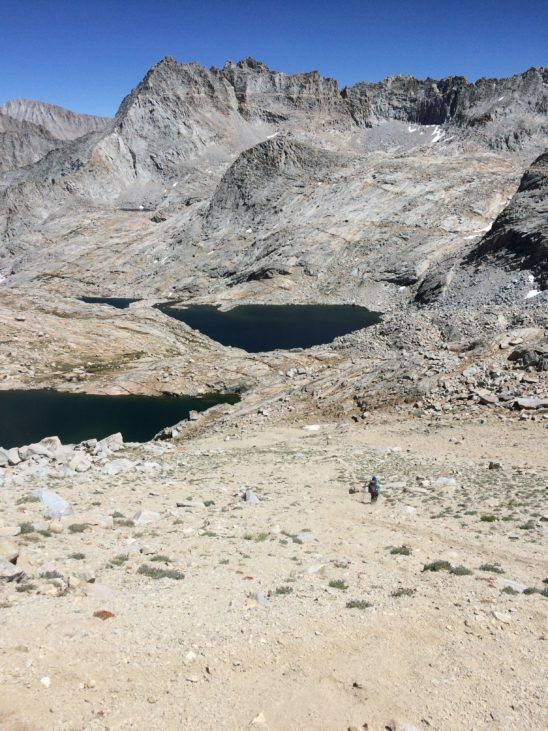 Two men were there that had turned around and aborted their plans when they heard from another hiker that the cornice over Longley was impassable. Unfortunately, our news that it’s indeed passable was just too late. There was a third man camped nearby, but we didn’t speak with him. It was 6pm and we had two miles on an unmaintained trail to our planned camping spot at East Lake. I know many would have been tempted to stop and call it a day at Lake Reflection, but we were stoked to have 2mi to unleash our legs. We were almost loopy for the trail and were pretty giddy to make a couple more miles. It was lightly used with cairns to follow and we had to reel ourselves in to make sure we didn’t injure ourselves with how giddy and fast we were moving. We hit the south end of East Lake and there was a ranger camped there. We pushed on to the other end of the lake, partly to get our own campsite and partly because we were just enjoying the hiking. We got to the campsite at 7pm. Whew! Another great day. It’s felt good to fill the days like this, and I’ve been wondering what kind of ground I could cover on this cross country stuff if I went more my natural pace, which is tough to do in a group. E and I are pretty comparable in both pacing and routine (we compromise a bit on routine) and we are thankful to have someone so compatible. We know we wouldn’t be as compatible on a regular trail with our differences in routines, but compromising to do routes like this together works pretty well. We got the tents up closer to 8pm after dinner and chores, and it was already getting dark in the trees. 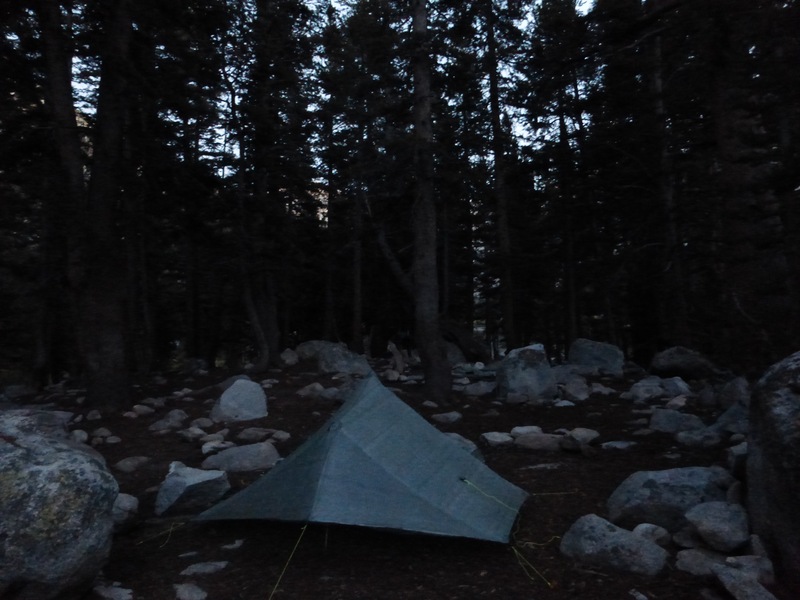 Here’s my tent, but E’s isn’t visible in the dark. I’m excited that there’s a stream next to the site. I’m going to sleep great! Finishing later each day and doing a faster pace, I’ve been falling asleep blogging these last few nights. 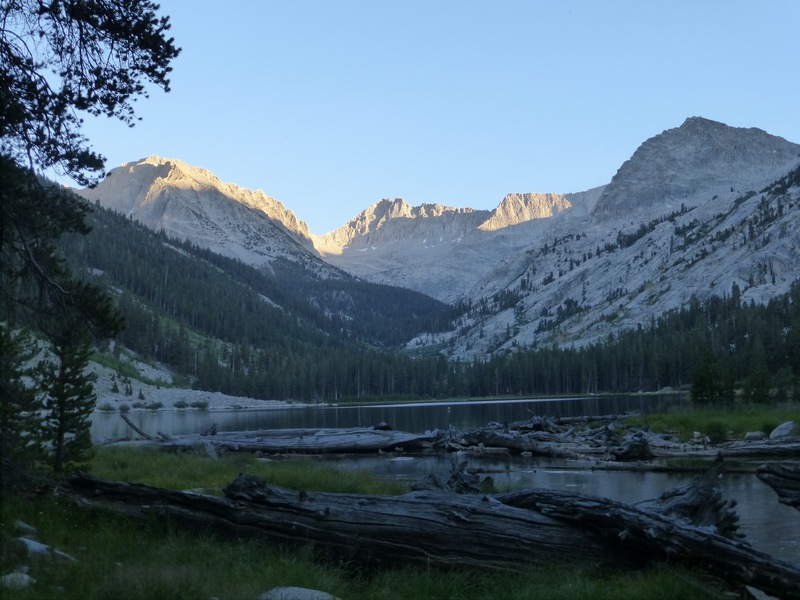 Tomorrow, we take a side trail to resupply and I’m happy for the break to be able to catch up on the blog more than to rest, ha! Laura and I wish you and E the best from Colorado high country. There are fires in the San Gabriels that are blowing up. Thanks Jean! The fires are everywhere unfortunately. I’m shocked just that part of these trips fell into place to allow these to all happen this summer. Enjoyed all the text and photos. Not a complaint, just a heads up: not sure if it is my computer or if others are seeing this, but only part of the photos load and you have to click on many X’s. Oh no, hopefully it all comes through ok now. This one had lots of photos and may just take longer to load. Well, it works fine now. Did need to wait 15 seconds for them to appear. But no Xs this time.